Duke began installing Smart Meters several years ago in the Southwestern Ohio area. You may have received a letter from them stating “the lines have sunk in your meter base and need to be repaired”. This sounds like a simple repair to anyone reading that correspondence. It's not. 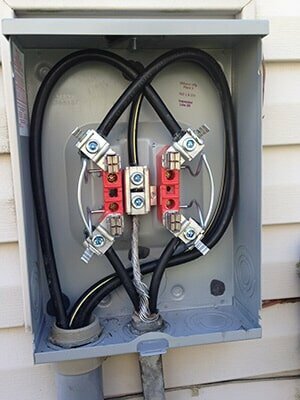 Depending on the severity of the damage it may be required to drop your service from the transformer in or around your yard. If it is this “simple” repair becomes a serious issue necessitating coordination between the County, Duke's Special Projects, Duke's Engineering Department and the Contractor. 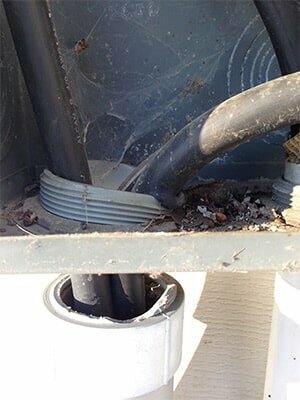 These installations require Permits, inspections and meter releases to be sent and received all in the same day. It is not a project for the Contractor unfamiliar with the process. As you can see in this example the “hot wire” ( the line carrying live current from the Utility Company Transformer) has “sunk” into the connector causing the insulation to be compromised to the point that there are bare wires exposed. If a person contacted this bare conductor they could be fatally or seriously injured. If the bare wires touches a grounded surface it could cause tens of thousands of dollars to Duke's equipment or could cause a fire that may result in property loss or loss of life. This is a serious condition and should be addressed. Also please note the connector holding the pipe to the meter base has been broken as well by the downward pressure from gravity. This is a repair using underground connectors. This enables the installer to add the necessary amount of line underground to extend the service up and over the lugs. This also provides for additional “future sink” as the wires are crossed over the lugs and lend plenty of extra room for any future settling. Please Call 513-227-4112 for free estimate. This is an “inside the can” repair. This allows the installer to place an “irreversible” crimp type connector on the sunken wire, tape it as required by Code, and re-install the wires on the lugs in the meter socket. Please also note the new “expansive” pipe installed in the place of the broken conduit. This will prevent any future settling from damaging the connection in the future. The materials are U/L listed and will pass inspection in all the Southwestern Ohio Counties. Please Call 513-227-4112 for free estimate. In all of the above installations Duke will have to come and disconnect your power at the Transformer to prevent any inadvertent grounding or electrocution issues. 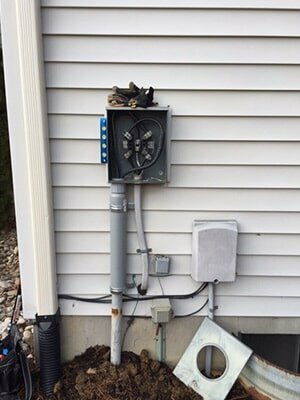 In order for them to turn the power back on to your home they will have to receive a meter release from the County Inspector after he inspects the job. The local Counties are familiar with this process and will either submit a pre-release ahead of time or will call it right from the job site to help expedite the service being restored. Duke usually responds to that “re-hook” order in a timely manner but depending on other factors it could take days for them to restore service to your home. The Contractor can only get the job done, Inspections performed and make those calls. It is up to Duke to get back out there and hook it up. Duke does not answer to any entity other than Duke so don't blame your Contractor if they don't get back that day! Please call with any questions! We have performed hundreds of these change outs!